Took delivery of new set of motors yesterday. It is model KL23H276-30-8B (8-wires, 3A/phase, 280 oz.in), ordered direct from China. Several US online sites also sell identical motors. With 2A/phase @44V, bipolar series, 1/4 step: reached more than 2000rpm (80ipm) before stalling. With 2A/phase @44V, half coil, 1/4 step: reached more than 1250rpm (50ipm) before stalling. With the above results, I'll be fixing it to the Sherline as bipolar series for high torque at low speed yet yield acceptable (>50ipm) rapids. I'm just too lazy to change the current setting resistor of the PICStep to try half coil with 3A. Probably give better, or equal, rapid speed compared to the bipolar series. 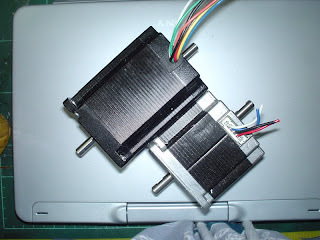 Photo below show the two motors side by side for comparison.